← No WAY That’s Pink! I’ve started the arduous process of cleaning and organizing my office. 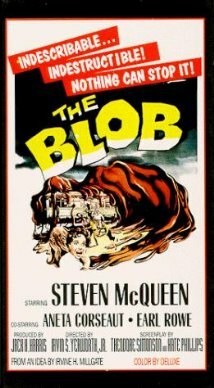 Think old horror movie The Blob where the black alien goo ball grows bigger and bigger and eats everything in its path and grows bigger and bigger. That’s how I stack stuff. That’s how I roll. Until I can’t stand it anymore, and the Blob must be destroyed. Anyway, I sorted through the kids’ school papers and junk mail and stuff that should’ve been filed somewhere normal. The floor in our living room was covered with all the stuff. Then I made progress and threw a large stack into the recycle bin. (Shhhh…I can’t keep all the school papers). All that was left were assorted notebooks, loose and bundled notes, old manuscripts, and grad school notes. Yeah, lots of notes. In that pile was the short story I wrote that led to my first science fiction novel. Awww. It was like looking at baby pictures—ugly baby pictures with a face only a mother could love. It was fun to read through my ideas and thought processes and the notes that a critique partner gave me. I even have a print out of our instant message conversation about the story and how twisted it was becoming. The story was one that I scrapped after writing half the novel. 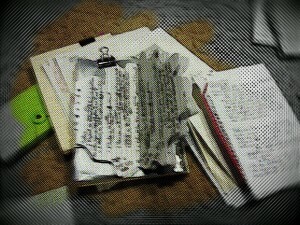 In fact, I scrapped writing completely for several years while in need of healing something that writing couldn’t help. The seed of that story took root though, and the characters started speaking to me with changed voices and stronger ideas. The story has been reborn as something very different from that science fiction dystopian idea that will never see the light of day. I plan to unleash the new phoenix on the world very soon. One tiny thought or comment or idea can inspire such an infinite number of other ideas and stories and characters. Even healing, especially healing. I love that, don’t you? The Blob in the office has almost been destroyed. I’m a slow destroyer of piles, but I will gain a sense of order in my writing space again. Also, I will cherish the old “baby pictures” and add them to the binders of my other writings that will never be read by anyone else. There may be more seeds in that blob of old ideas. First, I have many new ideas waiting to eat me alive, grow bigger and bigger, and take over the world. It’s better if the ideas do that and not my office mess. What are you up to this week? Are you a piler or a filer? How do you destroy your office Blobs?